• The jobs market continued to improve in June as 223,000 jobs were added. This measure of employment has been in a fairly narrow range for years and seems unlikely to change meaningfully in the near future. Disappointingly, neither earnings nor hours seem to have increased last month. • Coincident with the improvement in the economy is an move in expected inflation (as measured by various market measures) back toward the Fed’s long term 2% target. The FOMC members have said that inflation expectations being at the target and employment around potential are the two conditions necessary for rates to be normalized. 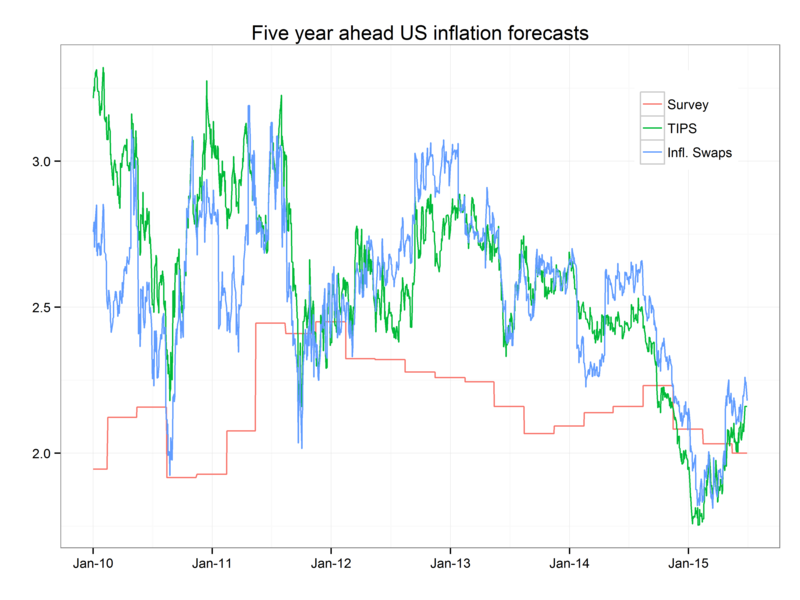 Inflation expectations were weak in the beginning of the year, and while the Fed claimed to be looking through these readings, they have to be satisfied to see inflation expectations normalize. • The view from the rest of the world is not so rosy. Europe continues to choose to allow 1% of the population take up all the time of the leaders of an entire continent. The situation is quite fluid and there do not seem to be any obviously good choices for anyone. The best news for US investors may be that the damage from five year train wreck is probably going to stay mainly on its own track, given the amount of time investors have had to worry. • Mainly, but not entirely. 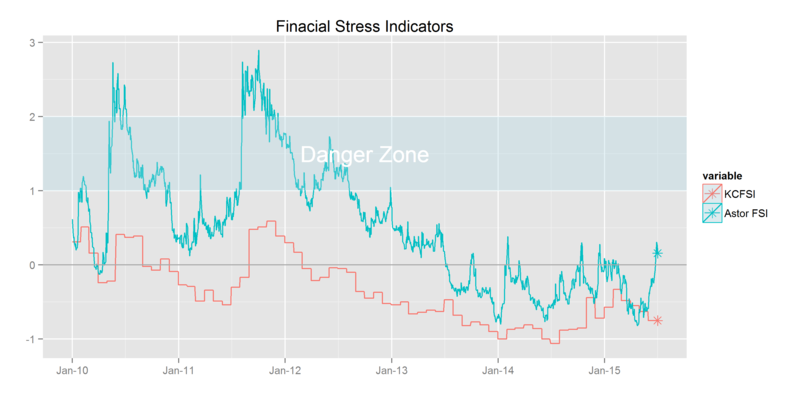 At Astor we track an index of financial stress (similar to the Kansas City Fed’s Financial Stress Index but compiled on daily data). This index has spiked over the last week. It started at very low levels, however, and is still below where we get concerned but nevertheless it shows that other stress-sensitive spreads reacted as much to the Acropolis Apocalypse than they did to the crude or stock market sell offs in the fourth quarter of last year. Stress seems to be dissipating in the last two days but we will keep a close eye on this indicator. • For global growth environment, our GDP-weighted measurement of the PMIs shows most of last month’s improvement was undone, though the measure still shows manufacturers’ orders expanding. 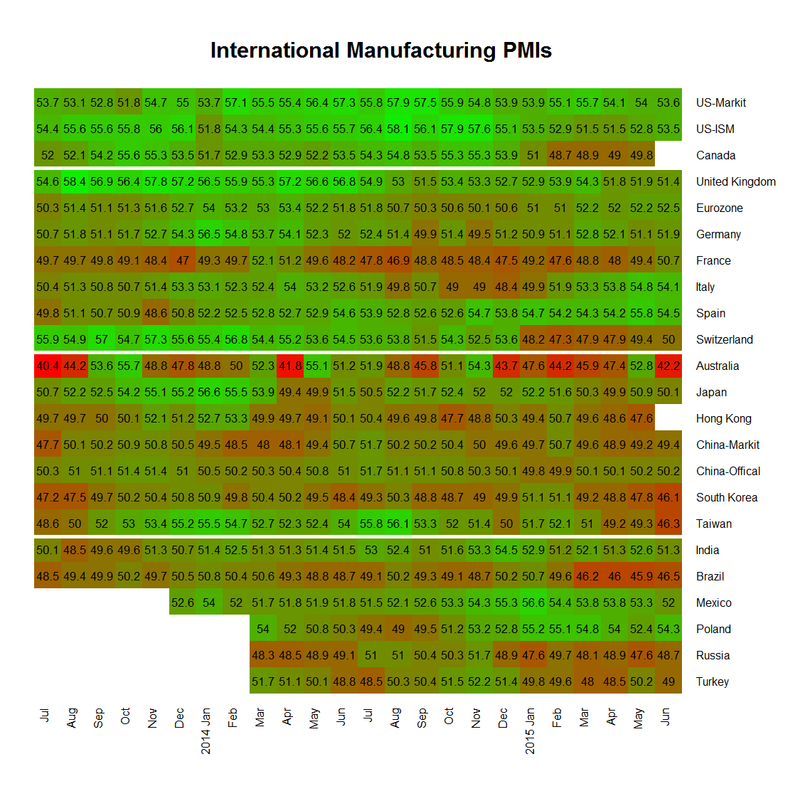 The weakness is focused in Asia, with the PMIs for China little changed and the Asian economies whose most important trade relationship is China (Taiwan, South Korea, Australia) showing additional weakness. All three of these economies show shrinking manufacturing orders as measured by the Markit PMIs. • Overall, the US is continuing to grow in a challenging external environment.